The pilot Pentland Firth and Orkney Waters Marine Spatial Plan (PFOW MSP) has won the Excellence in Plan Making Practice category at the Royal Town Planning Institute (RTPI) Awards for Planning Excellence 2017. The team was presented with the award at a ceremony in London on 15 June 2017. The RTPI Awards for Planning Excellence are the most established and respected awards in the planning industry. They highlight exceptional examples of planning and celebrate the contribution that planners and planning make to society. The PFOW MSP was one of 90 finalists competing across 14 categories and was the only shortlisted entry relating to the marine environment. The judges’ comments were “This plan, a first of its kind for the UK, should be held up as best practice for other councils struggling to integrate land and marine planning into a single plan. It is an interesting and imaginative approach to marine planning and given Britain’s maritime heritage, it’s surprising there aren’t more plans like this one”. More information on the awards can be found on the RTPI website. A working group, consisting of Marine Scotland, Orkney Islands Council and the Highland Council, has received a n award in the ‘Partnership’ category of the Scottish Awards for Quality in Planning (SAQP) 2016. This is related to Action point 17 Support coordinated approach to planning and key development at Peterhead, Cockenzie, Grangemouth, Hunterston, Pentland Firth and Orkney Waters. On October 14, 2015 Derek Mackay MSP, Minister for Transport & Islands announced a further £3.3m for walking and cycling infrastructure, matching last year’s investment of £39.2m for active travel projects, mainly for walking and cycling infrastructure. 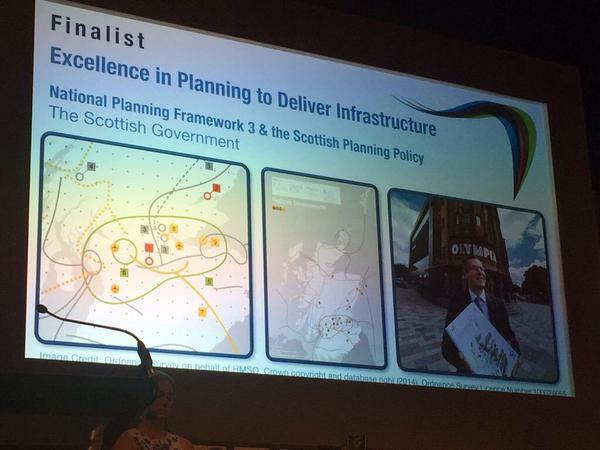 On July 6, 2015 it was announced that work on National Planning Framework 3 and Scottish Planning Policy had been successful in two categories, Excellence in Planning to Deliver Infrastructure (Award) and Excellence in Plan Making Practice (Commendation) in the 2015 RTPI Awards for Planning Excellence.